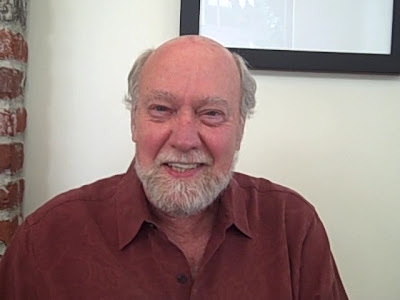 Harold Gray, now in his 31st year as artistic director of the Portland Piano International, is getting geared up for the 2009 Portland International Piano Festival. Running from July 12th through the 19th at the World Forestry Center, the festival is jam packed with an intriguing slate of artists, teachers, and films. I chatted with Gray at Café Umbria in the Pearl District where he gave me the lowdown on the festival. What type of pianists and concerts does the festival offer? Gray: For the Festival, I try to bring artists who often play lesser-known works. Andrew Russo offers everything from traditional classical music to techno-rock works. This recital includes music by the wonderful contemporary Australian composer Carl Vine, and pieces by Crumb and Adams as well as his own arrangements of Stravinsky, Mussorgsky and Borodin. Vine’s music is really taking off. His first sonata was a big hit at the Cliburn competition several years ago. Soheil Nasseri is a pianist who lives in Berlin and New York City. He brings an interesting program with Rachmaninoff, Schubert, and Beethoven, plus the west coast premiere of Richard Danielpour’s “Three Preludes.” Although I’m not familiar with this Danielpour piece, I know of his other pieces that are very expressive, beautiful, and accessible to everyone. Jeremy Denk is a true genius and an amazing pianist. He’ll be playing everything from Renaissance pieces by Byrd to Scarlatti and Ligeti sonatas. He’ll do a “Think Denk” lecture demonstration on July 19th as well. We don’t know exactly what he will be talking about, but I’m sure that it will be original and very, very interesting. The final concert on Sunday features the Anderson-Roe duo. This is Greg Anderson and Elizabeth Joy Roe. Roe was a participant in one of the recent the Van Cliburn competitions. She and Anderson graduated from Juilliard and formed their duo. Their concerts are a lot of fun. You should see their web site; it’s very entertaining at a high, high level. They do their own transcriptions of some traditional composer’s works like Busoni and Mozart, but they also do transcriptions of Radiohead and others contemporary groups. Paul Roberts will be here for a lecture and recital. He’ll also do some readings from his new book about the Ravel’s piano music. And that book is pretty close to publication. Oh, and I almost forgot to mention that the Van Cliburn silver medalist, Yeol Eum Son will be the here to play Schumann, Bates, Liszt, and Chopin. She has a huge repertoire, and it will be great to see her play - a real up and coming talent. This festival has a unique combination of artists who also teach. Gray: Teaching is very important to me. That’s one of the main purposes of PPI in general, and it’s very important for the Festival is to stimulate and inspire teachers. I include myself in that. The festival features teachers who are coming with different ideas: Gail Berenson, professor of piano at Ohio University and a past president of the Music Teachers National Association, and Jessica Johnson who teaches piano at the University of Wisconsin-Madison. They will be working with young pianists for a couple of days. 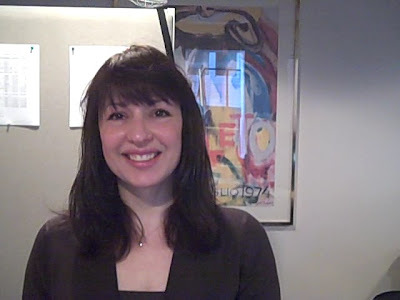 Catherine Kautsky will be here to present a lecture on Schumann and his influences and another lecture on the time around WWI when politics, music, and culture collided. We had over 60 applicants from young pianists who wanted to take part in the institute part of the festival. We could only select a dozen or so of them. There’s a group coming up from San Francisco to play duo piano pieces for Anderson and Roe. And the Festival has films as well? Gray: Yes, one of the films that we’ll be showing during the festival is about one of Jeremy’s teachers, György Sebök. Sebök was the teacher who was most influential in my musical life. We will also show a film about Artur Rubinstein that was thought to be lost. It was shown in the 1969 Cannes Film Festival and then forgotten. One of our patrons at PPI dug up the film. That re-discovery is an incredible story that involves Rubenstein’s family, 35mm film rolls, and a certain web site where people sell things. A lot of people were looking for this film, but our patron found it after doing an online search with an incorrect spelling of Rubinstein’s name. So the presentation of this film will be like a re-premiere. It sounds like a terrific week. Good luck with everything! Gray: Thanks! See you there! For more information about the 2009 Piano International Festival, click here. I came to Arlene Schnitzer Concert Hall with great anticipation on Saturday evening (June 27), because Helmuth Rilling and the Oregon Bach Festival choir and orchestra were in town to perform Haydn’s “Creation.” I had sung this piece under Rilling at least ten years ago (more about that later), so I willingly took a seat in the balcony where this hall's acoustics are best. Rilling knows this music forward and backwards, and he conducted the entire piece from memory, but this performance needed more spark and much more volume from the chorus. The lack of vocal heft from the chorus became evident right away when the choir sang “Und es ward Licht” (“And there was light”). The orchestra easily overpowered the singers so much that the word “Licht” was completely obliterated – even the final “t” couldn’t be detected. Later in the first part of the piece, the orchestra overwhelmed the chorus again. Fortunately, the balance between the orchestra and the choir was a lot better in the second and third parts of the piece, but the chorus still needed to project a lot more. Tenor soloist James Taylor sang outstandingly with supple articulation, light yet resonant tone, and excellent diction. Soprano Robin Johannsen’s clear and focused voice easily negotiated all of the tricky runs but didn’t have much warmth except when she sang of love during the first aria in the second part of the piece. Bass-baritone Christòpheren Nomura had plenty of warmth in his upper register, but his lowest notes were no-shows. That really hurt when he tried to project the low D while singing of the worm (“Am Boden, das Gewurmüm”). The orchestra seemed to have problems from the initial downbeat, because Rilling after acknowledging the opening applause quickly turned to the orchestra and began conducting without a moment’s pause. And Rilling often crouches – sort of like a cat – so his baton movement can’t be the easiest thing for orchestra members to see. This happened most right after the second part of the piece began. Some of the violins were not in sync, and even Rilling looked over that section in order to figure out what went wrong. On the positive side of the ledger, principal flutist Lorna McGhee accompanied the soloists superbly throughout the work. I really liked the super-titles that the Oregon Bach Festival used, but a computer glitch after intermission kept some of the titles from appearing for a short while. Before the concert start, OBF's executive director John Evans told the audience that the festival plans to return to Portland next year with two or three offerings. More will be revealed later. I have the highest respect for Rilling (and even have a Rilling bobble-head) and had the pleasure of singing this piece as a member of the Portland Symphonic Choir in some Oregon Symphony concert that Rilling directed. This was in the mid-to-late 1990s and an ice storm occurred during that concert series. The weather was so bad that a few of the orchestra members missed the dress rehearsal and the opening concert as well. One of the real treats of that concert series was to hear Thomas Quasthoff as the baritone-bass soloist. His voice is the gold standard. It is a rare treat to experience the top echelon of classical musicians, and the treat becomes all the rarer as the Guarneri String Quartet nears the end of its 45 year reign as one of the premiere string quartets in the world. Luckily, this ensemble has come to Portland as part of the Chamber Music Northwest Summer Festival to display the talents that have led to such a long and revered career. Friday’s concert at the Whitsell Auditorium was an intriguing glimpse into the workings of the quartet as the audience got the chance to listen to one of the quartet’s favorite pieces as well as hear the players give their thoughts on their experiences over the years. The evening was rounded out by a screening of Alan Miller’s High Fidelity, a documentary made about the Guarneri String Quartet in 1989. The quartet chose to play Zoltan Kodaly’s String Quartet No. 2 Op. 10 and gave a superb, if somewhat relaxed performance. The ease with which the performers played speaks to the combined years of experience they bring to each performance. The acoustics of the room acted to soften the sharp edges of the higher registers, but each instrument was clearly heard in the type of musical conversation that has prompted celebrated composers to write some of their greatest works in this format. Not as familiar with the works of Kodaly as the works of his Hungarian contemporary, Bela Bartok, this reviewer was impressed with the ability of Kodaly to effectively use a classical form such as a sonata structure yet imbue it with a life and vitality that is at once unique and yet strangely familiar. Thematic material arises, is developed, returns, yet along the way unexpected twists and turns send the piece careening off into uncharted territory. Emerging on stage to raucous applause, the Guarneri Quartet was gracious and in good humor. The atmosphere created by the mixed media format prompted an intimacy with the performers that lasted past their departure from the stage and through the film. The documentary downplayed the glamour often attached to being a professional musician. Instead it focused on the group dynamics between players, disagreements during rehearsals, family life, travels and tribulations, and the reality of living a life that involves at least 100 performances per year, spread out all over the globe. Rather than dispelling the mystique of professional musicianship, the film created an even greater admiration for those who can live that life for a decade, let alone those rare few who can make an entire career of it. Coming to the study of music only recently, this reviewer feels lucky to have had the opportunity to see the Guarneri String Quartet live and, as a fully immersed member of the short attention span digital age, feels especially lucky to have seen them in this format. Hearing this ensemble's music-making, the words of each member, and experiencing a little slice of the performers' lives served to increase the impression created by each member's skill individually and as a performing group. Over their long and illustrious career, the Guarneri String Quartet has exposed generation after generation to the great compositions of the existing quartet repertoire as well as those of more modern composers. This ensemble deserves the highest accolades and will remain one of the premiere string quartets long past the final time they step from the stage. Thursday evening, June 25, saw the renowned Guarnieri Quartet play the Chamber Music Northwest Festival as part of their farewell tour. After 45 years together, 2009 will be their last season. Reed College’s Kaul Auditorium was full to capacity to hear them play two late Beethoven quartets, No. 12 in E-flat Major and No. 15 in A Minor, Op. 127 and 132 respectively. These deeply pensive works seemed somehow fitting for a farewell concert. From the exclamatory opening chords of the No. 12 onward, the Guarnieri Quartet (violinists Arnold Steinhardt and John Dalley, violist Michael Tree and cellist Peter Wiley) displayed the masterful ensemble playing for which they are known. Their ability to generate a rich and complex depth of sound often gave the impression that there were more than four instruments on stage. Certain moments stood out as particularly exceptional. In the Adagio, cellist Peter Wiley was able to bring a delectable, murmuring melodic motive up from the depths, retreat until it threatened to fall back into the dense harmonic texture and then suddenly bring it forward to make its presence felt once more. There were times his singing timbre made it sound as though a second viola had entered. During the Scherzando, the entire group played a galloping mezzo-staccato couplet theme in perfect unision, drawing the full melodic meaning from this difficult texture. The old joke that Beethoven was the greatest composer who couldn’t write a melody was put to lie; the challenge is to find and draw out that melody, and this group certainly did that whenever it was called for. Opening the second half with the A Minor, the playing in parts of the first movement seemed a bit restrained, almost rote. This was soon remedied by the extreme, intentionally jarring dynamic contrasts of the Allegro ma non tanto. The middle of this five-movement work, the Molto adagio, was sublime and absolutely magnificent. The GQ interpreted the many different shades of this long, meandering segment with the utmost skill and dexterity. At times it felt forward looking, an almost Dvorăkian hymn to the splendorous, wide spaces of America. At other times it seemed as though Beethoven was quoting the main theme from Pachelbel’s Canon, and the GQ captured this sensitively, rendering a warm, woody intimacy that called to mind a chest of viols from a far earlier era. Their superb interpretation, their ability to intuit the spirit of the many different musics Beethoven seemed to be invoking was rapturous, and the auditorium felt breathless and transformed as the movement died away to a whisper. The Guarnieri Quartet plays at Reed College again tonight, featuring a concert of late Brahms, including the famous B-Minor Clarinet Quintet featuring Festival A.D. David Shifrin on clarinet. Just a couple of days ago, archaeologists showed off a flute that was found in the Hohler Fels Caves near Ulm, Germany. Carved from a bone of a Griffon Vulture, this 35,000-year-old flute has five holes and is about 8.5 inches long. The New York Times has a fuller account of this discovery here. Haydn and Mendelssohn have been dead for a very long time, but their presence is felt every time their music is played by virtuosic musicians like the ones who took the stage last night (June 23) at Chamber Music Northwest’s opening concert series. I attended the concert at Catlin Gabel School and found the each performance inspiring, because the performers got inside the music. The Orion String Quartet kicked off the evening with Haydn’s Quartet for Strings in B-Flat Major (aka “Sunrise”), which he wrote sometime after 1796 when he was 64 years old. The members of the Orion String Quartet (violinists Todd and Daniel Phillips, violist Steven Tenenbom, and cellist Timothy Eddy) mined every nook and cranny of this piece with their insightful playing. I loved the furious fiddling, the suspension of sound between themes, the sweet introspection in the second movement and how the foursome could achieve a blissful quietness as if it were second nature, the roughshod dance of the third movement, and the blistering finale, which the ensemble, at one point, pulled back organically as if they had a mind meld. Ah, Haydn himself would’ve loved it. The second piece on the program, Mendelssohn’s Trio No. 2 in C Minor for Piano and Strings (Op. 66), featured pianist Anne-Marie McDermott, violinist Ida Kavafian, and cellist Peter Wiley. They sculpted a lively interpretation of Mendelssohn’s masterpiece. The contrast between their gentle, almost lullaby-like playing in the second movement with the animated Scherzo of the third sounded terrific, and the finale got the audience to respond with thunderous applause. I always look forward to McDermott for her incisive playing and because of the incredible range of expressions on her face as she listens to her colleagues. At the end of the second movement, there was some discussion amongst the ensemble. After a pause, Kavafian then turned to the audience and said that Wiley used to play that movement with his mother and his brother. After intermission the Orion String Quartet was joined by violist Paul Neubauer, violinist Jun Iwasaki, Kavafian, and Wiley for a joyful performance of Mendelssohn’s Octet in E-Flat Major for Strings, Op. 20. The ensemble almost rocked out on this piece, especially with Iwasaki who seemed to animate everyone with his infectious gestures. I enjoyed the way that the music traveled within the ensemble, especially when a brief passage became sort of a hot potato that was exchanged from one instrumentalist to the next flawlessly. (Or like when a lateral pass between several players happens at a football game... you have to see it to believe it.) The fugue-like theme in the last movement was a high-octane work-out for all of the instrumentalists, and the audience fully embraced the collaborative achievement of ensemble at the very end of the piece. The program notes, written by Dr. Richard E. Rodda, pointed out that Mendelssohn wrote this piece when he was 16 years old, and that he followed it up the next year with his famous Overture to Shakespeare’s “Midsummer Night’s Dream.” I recall that Alex Ross, in a New Yorker magazine piece earlier this year, pointed to these facts and stated that Mendelssohn wrote mature music at a much earlier age than did Mozart. Ergo, Mendelssohn beat Mozart in the child-prodigy-composing claim to fame. It is not often that artists (of any caliber) die during a political protest, but Neda Salehi Agha Soltan was a victim of the Iranian crackdown. Her death was poignantly noted by Bob Kingston in his blog, dramma per musica, drawing from the news story that appeared in London Times online here. Neda Soltan was just 26 years old. Sometimes we think we have it pretty tough here, but just imagine if you were born in another country with much more challenging circumstances. The bicycle symphony will start at SW Park and SW Salmon just across the street from the Arlene Schnitzer concert hall at 4pm. Wear your pin stripes, fancy pants, top hats and gloves for a traveling symphony on bikes for bikes. This events is FREE. Please bring YOU, your friends, your sweet and snappy pants, and of course, your bike! Bells, horns and other bikey musical instruments welcome! After the performance of the bicycle symphony we will make our way to the South Waterfront where there will be Hotlips pizza and Hopworks beer available for FREE! And after chowing down, we will have a good old-fashioned chamber jam from 6-8pm at Atwater Place - 3660 SW RiverPkwy., Portland, OR 97239. Please keep in mind that these events are free, all ages, and EVERYONE is welcome. Hope to see you there! Chicago Opera Theater recently asked people to vote on which opera they would like to see the company perform during its 2011 season. Apparently, in order to cast a vote, you had to pay $1. This is the second time that the COT has tried this, and the winning opera (I'm assuming from a list of possibilities) is Shostakovich's "Moscow, Cheryomushki." Wow! That different! Here's a short account of the COT's unusual vote/fund raiser. I'm wondering if the Oregon Symphony could try such a thing (assuming that its web site could handle the voting). You would pay to cast your vote for a piece on a particular program. If your life is filled with regret over past decisions, especially in the realm of love, then money and public adulation won’t really soothe the core of your being. That’s what the character of Desirée Armfeldt reveals during the most poignant moment in “A Little Night Music,” the Stephen Sondheim musical that is holding court at Mock’s Crest Theater. I attended the performance last night and enjoyed the way that Margie Boule played Armfeldt. Boule’s singing of “Send in the Clowns” was filled with enough resignation and genuine emotion to cause some audience members to sniffle because they were caught up in her character’s predicament. Another strong performance in this production came from Stacey Murdock as Fredrik Egerman, the man who belatedly realizes that he loves Armfeldt. With his acting and singing Murdock convincingly captured Egerman’s conflicted nature down his loafers. Debbie Hunter turned in an exceptional performance as Countess Charlotte Malcolm. With spot-on timing, Hunter delivered her barbed lines perfectly. She punched holes in the egos of all of the story’s characters except for that of her husband, the Count Carl-Magnus Malcom, played with an aptly inflated sense of himself by Douge Martin. As the seminary student Henrik Egerman, Connor Bond practically embodied the anguish and frustration of a young man in love with his step mother. Bond was nicely paired with Danielle Larson, who energetically created the very young and naïve step mother, Anne Egerman. Eva Wolff performed the brash role of Petra with gusto and showed off her fine mezzo-soprano voice in her singing of "The Miller's Son." Janet Penner as Madame Armfeldt bragged and commanded others with conviction. Kelliann Wright charmed the audience in the role of the granddaughter, Fredrika Armfeldt, and Andrew Wade more than held his own as the butler Frid. John Vergin, Alexis Hamilton, Elizabeth Bacon, Jeremy Sloan, and Maria Lewis-Leatha as the Liebeslieder Singers nimbly negotiated the confines of the small stage. I enjoyed how they spied on the goings-on of the main characters. Kristine McIntyre enhanced the production with clear directions that made me almost forget how small the stage at the Mago Hunt Center Theater really is. Mock’s Crest pulled out all the stops with its costuming for the female characters, all of whom sashayed about the stage in full evening regalia for upper crust Europeans during the fin-de-siècle prior to WWI. The dresses, long evening gloves, fans, and occasional headdresses added color and a touch of glamour. The rotating parts of the stage (one to the left and the other to the right) added another creative touch that made this production work well. Scenic designer Lawrence Larsen used a suspended house and the image of a shimmery lake in the final act to paint the picture of a placid summer evening in Sweden. This production has some problems in vocal quality, and some singers also had problems with projecting their voices adequately. Fortunately, the orchestra, conducted by Roger O. Doyle, accommodated for the variances in volume with sensitivity. As a result, the audience left the show feeling serenaded into the evening air. 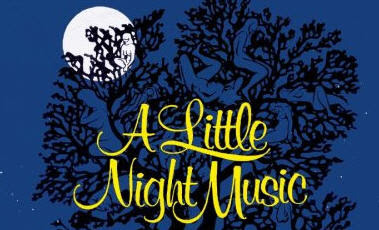 Mock Crest Theater’s “A Little Night Music” runs until June 28 at the Mago Hunt Center Theater. Call 503-943-7287 for tickets. David Stabler of The Oregonian has a full report on the financial problems at the Oregon Symphony in today's print edition and online here. It's a tough time for arts organizations everywhere, and the orchestra's president Elaine Calder says that she will scrutinize every nook and cranny in its budget and operations to see what other things can be done. Calder was in Chicago this past week for the 64th National Conference of the League of American Orchestra, and I'm sure that fund raising and budgets were among the issues most discussed. So, the Oregon Symphony is not the only orchestra that has made great strides under Kalmar. This Father’s Day Weekend, Opera Theater Oregon aspires to make no sense to viewers with a sin-soaked night of Dada. 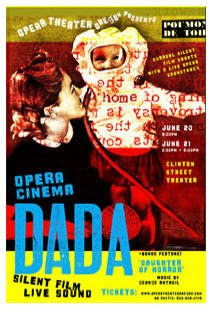 Opera Cinema: Dada collages together 11 surreal silent film shorts with live soundtrack of opera singers, chorus, cabaret band, and sound effects, plus bonus feature, big screen showing of notorious, almost-silent classic, Daughter of Horror. Why not embrace the absurd: give Dada a hug. June 21, 3pm - ALL AGES MATINEE! 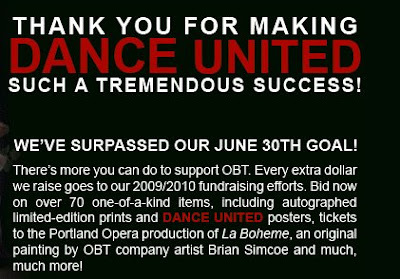 The Oregon Ballet Theatre has made their goal to stay alive. That's great news! Let's not forget the Oregon Symphony, which also needs help! 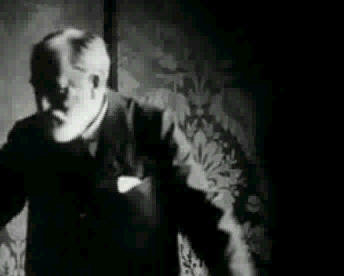 Terry Teachout has posted a short silent film made in 1915 of Camille Saint-Saëns conducting. Click here to see the clip. 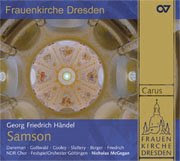 Carus Verlag recently released a new three-disc set of Handel’s titanic oratorio Samson, featuring Nicholas McGegan again teamed up with collaborators the FestspielOrchester Göttingen and the NDR Chor, as well as a bevy of world-class soloists. Although only three years old, one can expect many great things from the FestspielOrchester in the future; under McGegan they have released three Handel works on the Carus Verlag label: Acis und Galatea, Solomon, and now Samson. The story of the biblical hero Samson proved fertile ground for Handel’s boundless imagination, and there are few as well-equipped to realize Handel’s vision in our day as Nicholas McGegan. Thomas Cooley, singing the title role, delivers a mixed performance in this release. While technically never less than precise, some of the arias, especially on the first disc, come off as just that—technical. While such precision is admirable, if it is not accompanied by sympathetic emotional interpretation, it may come off as dry, a risk that runs particularly high when singing works from the Baroque. Alto Franziska Gottwald, in the important role of Micah, has a voice that is heavy and oft overbearing. McGegan and the FOG are absolutely spectacular—in addition to the the flawless accompagnato skills they bring to the table, the sinfoniae that are scattered throughout exhibit crystalline perfection and could stand alone. The NDR Chor is as able and exact a baroque choir as one could want, and their English diction (for a non-native speaking choir) is superb. Early music lovers will find everything delightful about the baroque era in this three-hour epic masterpiece. If you are heading for the coast this weekend, you might want to experience the Astoria Music Festival, which runs from June 19 through the 28th in downtown Astoria. In the space of ten days, this festival offers orchestral concerts, chamber music concerts, opera, and new music. Cary Lewis, Dorothy Lewis, Ines Voglar, Joel Belgique, David Buck, Richard Zeller, and Amy Hansen are just a few of the local musicians and singers featured in this festival. Programs include music by Beethoven, Verdi, Mendelssohn, Tchaikovsky, and Purcell ("The Fairy Queen"). Plus, Molly Barth and Beta Collide will perform contemporary pieces on Wednesday evening. Keith Clark conducts all of the large programs. The performers for this first concert include the Orion String Quartet (Daniel Phillips, Todd Phillips, Steven Tenebom, and Timothy Eddy), Jun Iwasaki, Ida Kavafian, Paul Neubauer, Peter Wiley, and Anne-Marie McDermott. This year, the CMNW Summer Festival is using more venues than ever before. So be sure to check the times and places for each concert. David Stabler reports that the Oregon Symphony will probably be asking its musicans to help cover budgetary problems going into next season. In short, even thoough the Symphony had its best season ever at the box office ($6.6 million in ticket sales) and has greatly reduced its administrative overhead, it will now be forced to ask the musicians themselves to take a big pay cut. Ugh! Over the past few years, I've heard a number of orchestras in live performances and can say - with no reservations - that the Oregon Symphony under the direction of Carlos Kalmar is one of the finest orchestras in the nation. It's a great musical organization that deserves your support. I'm going to increase my donation to the Oregon Symphony this year, and I hope that you can, too! After winning two first prizes from ASCAP, this season we made a conscious decision to focus instead on three major collaborations: the Beethoven Mass with the PSU Chorale, Messiaen's Oiseaux Exotiques with Orli Shaham, and Verdi's Falstaff with Richard Zeller and the PSU Opera Theatre. Although we continued to present music of prominent contemporary composers, we decided to work in more detail in preparation for the performances to insure that these important collaborations were successful. Our upcoming season will continue to focus on collaboration and education. Thanksgiving weekend, for example, we are presenting the complete Rossini-Resphigi ballet La boutique fantasque with the Portland Ballet. Of course there will be another surprise guest artist in the winter, and another major opera production in the spring. We also plan to continue performing the music of our time. We are particularly excited to represent the state of Oregon as a participant in the current Ford Foundation national commissioning project: by the end of the upcoming season, the new Joseph Schwanter piece Chasing Light will have been played by orchestras from all 50 states. A brand new ensemble, called Trio Peridot, will perform this Tuesday evening (June 16) at Sherman Clay Pianos in the Pearl District. Trio Peridot consists of pianist Susan Chan and Eugene Symphony Orchestra members Matthew Fuller (violinist) and Anne Riddlington (cellist). They are giving their debut performance with a concert that features music by Beethoven, Schumann and Weber. The concert starts at 7 pm on Tuesday at Sherman Clay/Moe's Pianos (131 NW 13th Ave. in Portland). Donations are accepted. Matthew Fuller, violin, Anne Ridlington, cello and Susan Chan, piano will give their debut performance at Sherman Clay/Moe’s Pianos. They will be performing Beethoven’s Piano Trio in B-Flat Major, Op. 11, Weber’s Piano Trio in G Minor, Op. 63, and Schumann’s Fantasiestücke for Cello and Piano, Op. 73. A native of San Jose, California, Matthew Fuller began playing the violin between the ages of 2 and 3. He studied at the preparatory program at the San Francisco Conservatory of Music, and holds a bachelor's degree from Rice University and a master's degree from Wichita State University, where he studied with Isadore Tinkleman, Kathleen Winkler and Kenneth Goldsmith, and John Harrison respectively. He has performed as concertmaster of the WSU Symphony Orchestra as well as first violinist in the Ozmodiar String Quartet and the Wichita Symphony Orchestra. Currently Matthew is Principal Second Violin in the Eugene Symphony Orchestra, first violinist in the Oregon Mozart Playersand the Eugene Opera Orchestra. He also performs with the Portland Chamber Orchestra, the Oregon Bach Festival, the Ernest Bloch Festival, and the Oregon Coast Music Festival. He currently lives in Eugene with his wife, pianist Crystal Zimmerman, and their enormous cat Frankie. A native Oregonian, Anne Ridlington received her bachelor’s degree in cello performance from Indiana University School of Music, where she studied with Tsuyoshi Tsutsumi. She performed for a year in Germany as a member of the Lubeck Symphony Orchestra. She currently has a teaching studio in Corvallis, Oregon, and is a member of the Eugene Symphony, the OSU-Corvallis Symphony and the Oregon Mozart Players. She is also a regular performer in the Chintimini Music Festival in Corvallis. Susan Chan is an active chamber musician and soloist. She has performed in the US, Canada, Europe, Australia and Asia, and has received critical acclaim for her performances. In addition to having performed in venues such as Weill Recital Hall at Carnegie Hall in New York and Steinway Hall in London, she plays regularly in retirement homes in the Portland area. Her CDs East West Encounter I and East West Encounter II were recently released by the MSR label. She is also an active master class teacher, adjudicator and workshop presenter. 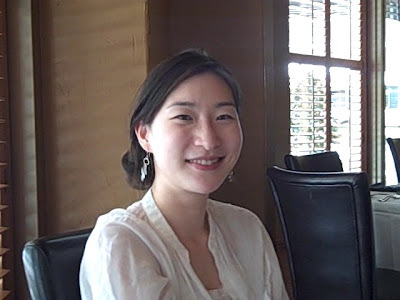 Ms. Chan holds a Doctor of Music degree from Indiana University, and M.Phil. and B.A. degrees from the University of Hong Kong. She also pursued postgraduate studies at Yale University and holds the Fellowship and Licentiate Performance Diplomas from Trinity College of Music, London, UK. Her major piano teachers include György Sebök and Menahem Pressler. 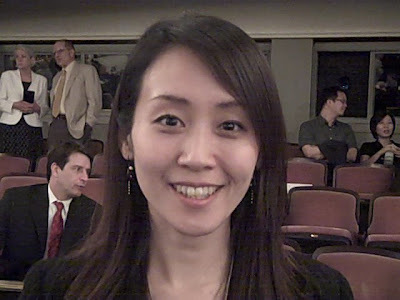 In fall 2004 Ms. Chan joined the faculty at Portland State University as Assistant Professor of Music and Piano Area Coordinator. 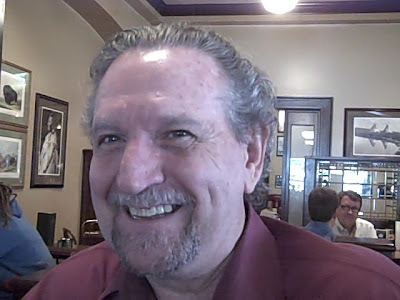 I caught up with Stephen Llewellyn (aka Operaman) at Jake's Grill yesterday. Some of Llewellyn's friends, in appreciation of his generosity, got him a year's subscription to Met Player, an online video service provided by Metropolitan Opera. And Llewellyn told me about a creepy yet fascinating performance by Bryn Terfel in a production of Don Giovanni at the Met in 2000. Llewellyn has an interesting background, having sung as a chorister for Benjamin Britten and taking voice lessons from Peter Pears. He also subbed for Ian Partridge once at the Royal Festival Hall in London singing a performance of Rameau's "Castor et Pollux." This year's competition had a lot of excitement after the last concert finished. The press in attendance was very divided regarding who the medalists would be. Most of the critics agreed that Bulgarian pianist Evgeni Bozhanov played himself out of contention with his bombastic style. But all of the five remaining competitors were mentioned as possibilities. We should have done a pool to see who would've predicted the outcome correctly. The awards program featured Portland-native Fred Child as the master of the ceremonies. It turns out that the blind Japanese pianist who shared the gold medal, Nobuyuki Tsujii, released a recording last year (many of the pianists in the competition have already done albums), and it's now selling like hotcakes, according to this report. That album also contains a couple of Tsujii's own compositions. I was impressed to learn how thoroughly and carefully the participants are initially screened. Richard Rodzinski and John Giordano assemble a jury that travels around the globe to hear the best pianists. Still, ten of the final 30 pianists had some Juilliard connections, which either points to how good Juilliard is or means that the screening process still needs some improvement. In any case, at the competition itself, the jury puts their scores into a computer (somewhat like the BCS system for NCAA football) and the computer gives them the final results. Of course, not everyone is happy with how things turn out. Benjamin Ivry, in his article in the Wall Street Journal, thought that the jurors were way off the mark. He sounds fairly bitter. It should be noted that Ivry incorrectly states that Giordano is the regular conductor of the Fort Worth Symphony. Miguel Harth-Bedoya is the conductor of that orchestra. Scott Cantrell of the Dallas Morning News points out, in this posting, some other inaccuracies in Ivry's argument. Also, Ivry doesn't think that blind pianists should play with orchestras. That's nonsense. Then a deaf composer like Beethoven shouldn't write music. Now I'm wondering if there should be a competition for pianists in which only new music is performed. Assembling a jury for such a competition would be very interesting. Just for fun, all the pianists could be asked to play John Cage's 4'33". The New Music Box has the lowdown on all of the orchestras (big budget category to the small budget ones - plus college and youth orchestras). I'm surprised that Portland State University and its conductor Ken Selden didn't win again in the college category, but they were beaten out by Cornell, Peabody, and Brown. Maybe the upshot is that new music is catching on. The announcement was made in Chicago where the League of American Orchestras is holding its annual meeting. 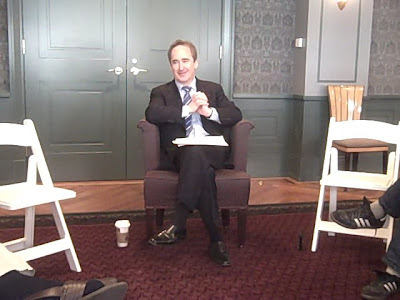 In the photo, John Giordano is on the left and Richard Rodzinski on the right. 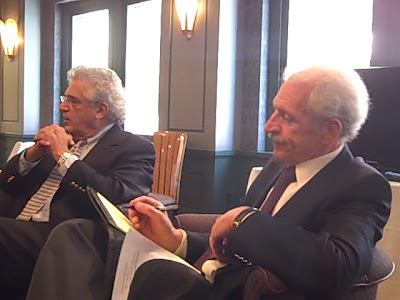 Richard Rodzinski, president of the Van Cliburn Foundation and John Giordano, chairman of the jury, subjected themselves to numerous questions by the press. Here’s a compilation of some of the questions and answers (some of which wandered away from the questions). This conversation took place before the final round. I just haven't had enough time to post it until now. Is there any way to assess the career potential of someone who only gets to the preliminaries or the semifinals versus someone who gets to the finals? Rodzinski : Those who have studied these competitions find that the cream does rise to the top. You can have winners at the top who are very close together so that their final rankings are extremely close. The outcome depends on the subjective judgment of jury. Giordano : That’s why we seek to have a diverse jury, and subsequently their judgments may lead to a top three winners who are equally deserving. Rodzinski: In order to avoid a split jury, it is critical to have jurors approach music pretty much the same way, so that there is a cohesiveness, and no one has to compromise on a candidate. We have something built into our system so that if three or more jurors feel that a candidate is a potential medalist and does not pass on to the next round then we open it to discussion. That helps us to prevent ending up with a compromise candidate. I think that no major talent has slipped through because of this. There are more contestants from Asia or are Asian-American, but the jury doesn’t reflect that so much. Rodzinski: The Asian wave among the contestants is very obvious. In Japan, for a long time now, playing the piano is a very prestigious pursuit. More recently this pursuit is being picked up in China. And China has had a one-child policy; so parents are investing everything they can in that one child. Music is considered a big part of education, and there’s strength in numbers. We’ve heard from reputable sources that there may be up to 50 million pianists in China. For the last several years we have wanted to hold some screening auditions in China, but we were told by the conservatories there to wait. They told us that the quality of pianists you are looking for are in the US and in Europe but not here yet. More recently they’ve told us that they are getting closer. The first wave of Chinese pianists who have been trained in the West are coming back to China and teaching. So, we did hold a screening audition in China for the competition but didn’t really hear all that many pianists. So, as far as the jury is concerned, there aren’t that many pianists who have the wealth of wisdom that we are looking for in a potential member of the jury. Have you changed tactics in how you are marketing the competition? And what kinds of audiences are viewing the on the internet? Rodzinski: Yes, just putting an ad in the paper doesn’t do it anymore. We are wide-open to suggestions. Our internet efforts are going quite well. We had over 50,000 unique viewers at the end of the semi-finals. The actual page visits were over 500,000. So we’re hoping to reach people who have never been to a concert before. The video feed is being seen by people in over 170 countries. We are asking people to tell us who they favor in the competition and responses are pouring in. We are streaming the rehearsal sessions with Conlon and the orchestra as well. The jury is forbidden to see them. What happens if a pianist has or had a teacher who is on the jury. Rodzinski: In that case, the jury member must abstain from voting on that contestant. Giordano: The jury also doesn’t discuss the contestant afterwards. Discussion just makes them dig in with their opinion. And their vote is their opinion. If three members of the jury feel that we missed a medalist, then we do address it with discussion. And every one of the jurors – I can’t think of an exception – can write out every one of the notes of the pieces that are played. 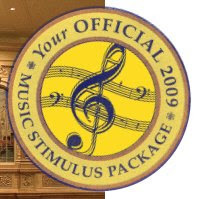 If someone is using a piece of music as a platform to get a visceral response or being sensationalistic, like playing ridiculously fast or ridiculously loud, quite often the public will respond with enthusiasm to that, but the jury will not, because that is incorrect – even though there is great latitude to interpretation you cannot completely destroy the composers intent. The jury considers the inner harmonics – the inner voices of the piece – does the contestant really understand that piece. And this is as knowledgeable of a jury as we have ever assembled. They really know that piece. They know when there’s a memory slip or a wrong chord. And they know that every contestant might experience a memory slip. The jury knows that this is not a final conservatory exam. What is the impact of having an overhead screen for the recitals? Rodzinski: Very positive. People’s attention spans are shorter these days. So, we’ve added the overhead screen to make the recitals more visually exciting. I hated it at first, but then we found that the concentration level in the audience has improved greatly. There’s less coughing than before. The screen gives them a visual cue to what to listen for, and that has made a tremendous difference. Maybe we can do more to make the programs more exciting. We are open to ideas and suggestions that you have with will improve the audience’s experience. Is the scoring of the jury cumulative? Giordano: Our scores are not cumulative from round to round. I’ve served at other competitions that allow cumulative scoring and what happens is that your opinion can be greatly changed from the preliminaries to the second round. And, let’s say, if you scored someone high in the first round, and then decided in the second round that you were wrong about that person, you end up trying to artificially adjust your score because it’s accumulative, and you have your eye on the end result. When we first did this competition there were more rounds, and it was more like the final examination in a conservatory: let’s hear the exposition and now let’s hear the fugue and so on. And back then I would choose the repertoire. As the competition evolved, I thought that this is not what were supposed to do. We should be seeking artists who have already gone through that. Plus you don’t get a feel of the architecture or how to put a program together. So the competition has evolved. Some pianist are better at classical repertoire and some at romantic. The jury has access to the competitor complete repertoire. Some of these kids have every Mozart concerto in their repertoire. The general public is not privy to that. We have a lot more information to consider. Rodzinski: Contestants who have a tiny repertoire may not even get a screening audition. But the competition is part of their apprenticeship. Pianists in their 20s are not masters. So for each round the judges start afresh with each remaining contestant? Rodzinski: Not entirely. They keep their judgments in their heads. They don’t have the scoring on paper. That is, the first round is not worth 20 points. We ask the judges whenever they vote for the semifinals and the finals to bear in mind everything they have heard up to that point. Let your head be the computer to assess the full picture. Giordano: One of our goals is that the judging process is very transparent. If there is anything at all going on in the way of gaming, that person will be dismissed. Are your donations and corporate sponsors holding steady? Rodzinski: No. Some corporate sponsorship is in jeopardy. And donations are down. Our endowment has been impacted. We’ve cut back on all expenses, including salaries in preparation for next year, because it’s going to be a tough year. Rodzinski: In non-competition years, it’s 2 million, and in the competition year, it’s a over 4 million. We’ve got a lot of in-kind donations, for example, from American Airlines, and we have a huge number of volunteers, including the families that host the pianists. We couldn’t do the competition without them. The Van Cliburn drew plenty of press folks who liked to share their viewpoints on the competition. Here’s Paul Horsley of The Independent. 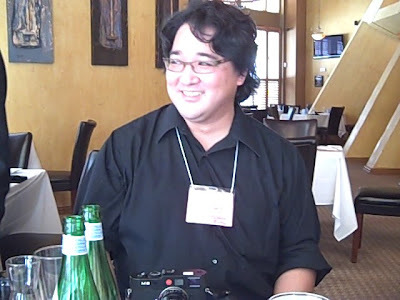 Ken Iisaka, a finalist in the 2007 International Piano Competition for Outstanding Amateurs (hosted by the Van Cliburn Foundation), was one of the official Van Cliburn bloggers. Laura Grant did a stellar job in running the press room, which always had plenty of refreshments and laptop connections. Grant will be doing the communications for the Santa Fe Chamber Music Festival in August as well. Operaman (aka Portland Opera's blogger Steven Llewellyn) has just posted how all of the spectacular opera events went for Priscilla Barrow, the music teacher from Washington DC who got his tickets to the Washington Opera's ball at the German Embassy. Barrow made a wonderful debut, was interviewed by the Washington Post, enjoyed box seats at Thursday's finale of "Turandot" plus a post-performance dinner with Plácido Domingo and Aretha Franklin! Wow! 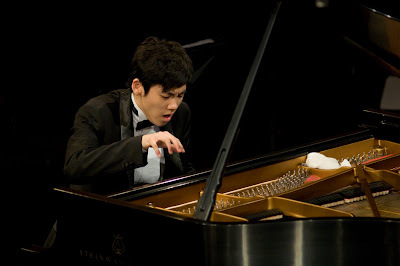 Van Cliburn winners announced - Asians sweep! The jury vote was cummulative assessment after every round. I only heard the final round, but still came sort of close. I've only got a few minutes to collect my thoughts about the six concert in the final round of this competition. Nobuyuki Tsujii gave the recital portion with pieces by Beethoven, Chopin, and Liszt. He did very well (especially considering that a Japanese TV crew just stopped in as well as more Japanese press and his university colleagues), but seemed to be unable to get some of the spontenaity and joy that some passages in the Liszt. Haochen Zhang played the Prokofiev Piano Concerto No. 2 with technical perfection. He was really with the orchestra. I'm still not sure about his emotional range. Di Wu played the trumph card, Rachmaninoff's Piano Concerto No. 3, and it was dynamite. She was in her element and gave everyone the ride of their lives with full dynamic range. She is back in the running for a medal. I don't envey the jury in trying to figure out how to score all of this. I've got Vacatello at the top with Tsujii and either Son or Wu in second or third. We'll find out very soon what the judges say. For those of us who wanted to hear how quietly a pianist can play in a concert hall, Di Wu answered our prayers. The Chinese pianist used the softest, lightest, most delicate touch in her performance of Bach's Toccata in F-sharp minor, BWV 910. Her playing forced the audience to listen so intently that no one in Bass Hall in last night's concert (Saturday, June 6) moved a muscle. For her next piece, Wu transitioned to another time zone by playing Schoenberg's "Klavierstucke" Op. 11. Wu wonderfully created the abstract and random landscape in this work. Moments in the piece also seemed to convey a series of questions and answers as the music switched from one path to another. Wu ended her recital with Ravel's "Gaspard de la nuit," and I felt that she excelled in achieving a spontaneous feeling in her playing - especially in some passages that were lightening quick. Overall, Wu performed very well and made a fine case for herself to move up the ladder in the competition. The concerti portion of the program began with Evgeni Bozhanov's performance of Rachmaninoff's Piano Concerto No. 2 in C minor, Op. 18. The Bulgarian pianist set out to play the piece as loudly as possible, drowning out the cellos near the beginning, and continued through the enitre piece with this to-hell-with-the-orchestra attitude. This turned the Rachmaninoff work into a pianist versus the orchestra affair which everyone increasing the volume to the highest level possible. Bozhanov also messed up several passages and was very erratic at times. His crass interpretation left me numbed but the audience exploded, so I guess his gambit worked. In sharp contract, Mariangela Vacatello gave a thoroughly engaging performance of Prokofiev's Piano concerto No. 3 in C major, Op. 26. Her sound was very balanced and precise. She wonderfully built up tension in the first movement and released it with the orchestra as a partner in making the music happen. I loved the way that Vacatello alternated the robust and tender themes of the second movement, and she ended the piece with the orchestra in an electrifying blitz. Fortunately, the audience recognized her genius in this performance and gave her a standing ovation. I think that Vacatello moved herself into gold medal contention with this performance. Tsujii is still there as well, with Wu and Son following. But there's one more concert to go. Before leaving for the Van Cliburn Competition, I wrote a preview of today's Clark College Orchestra for The Columbian newspaper (Vancouver, Washington). The concert features a guest conductor from Spain and a guest pianist from Italy. You can read about this concert, which will take place today, by clicking here. Today was a two-fer with one final round concert in the afternoon and another in the evening. The afternoon's concert reflected an increased attendance, and the hall was almost filled to capacity. Chinese pianist Haochen Zhang opened his recital program with Brahms' Variations and Fugue on a Theme by Handel, Op. 24, which showed off his great technique and impeccable precision. However, it also revealed Zhang's limitations in terms of being able to provide more contrast that would keep the piece interesting. Zhang also had the annoying habit of tapping the floor or a pedal so loudly that it became its own percussion section. And he hums loudly at times. These unfortunate idiosyncrasies get in the way of the music. After the Brahms, Zhang played Ravel's "Gaspard de la nuit" and gave the audience a wider range of emotion from fluttering, light, transparency to muttering in the depths. For the concerti portion of the concert, Korean pianist Yeol Eum Son tackled Prokofiev's Piano concerto No. 2 in G minor, Op. 16. Son wrestled this difficult work and came out with the upper hand, but not without some scars. She seemed out of control a couple of times and missed some notes. However, I really enjoyed the way that she teased the orchestra and then played together with it and then teased it again. She also showed tenaciousness and muscle that made her playing convincing. After the break, Japanese pianist Nobuyuki Tsujii performed Rachmaninoff's Piano Concerto No. 2 in C minor, Op. 18. Tsujii rushed the passage with the orchestra right after the beginning of the piece, but then got into sync and showed sensitivity and a warmth in his playing. One of the best parts occur ed when Tsujii and the orchestra were racing at a fairly good clip and then slowed down and quieted down exactly together. It was as if Tsujii had extra-sensory perception. I enjoyed his playing and still cannot fathom how he learned this piece. At the point, I still see Tsujii in the lead, with Vacatello and Son following. After the concert on Friday, I went the press room and then went around Bass Hall on the way to my hotel. Just at that moment, Van Cliburn was leaving the hall. Stanislav Ioudenitch, the 2001 Gold Medal winner and his daughter are next to Van Cliburn. I understand that Ioudenitch's daughter is a fine violinist. I noticed that Van Cliburn could barely take two steps before someone would come up to him for an autograph or want to give him a hug. Well, he seems to take to the time to comply with every demand in a very nice and gracious way. Last night's concert (Friday, June 5) in the finals seemed to juggle things a bit more. Bulgarian pianist Evgeni Bozhanov presented his recital program first. He started with Takemitsu's "Rain Tree Sketch I" and gave it a very delicate, impressionistic flavor. It seemed light as air and carefuly constructed. Bozhanov followed it with Schumann's "Davidsbündlertänze," a long musical dialogue. Despite Bozhanov's wide range of expression and skillful technique, I have to admit that I lost the thread of this piece about halfway through. Bozhanov then played Liszt's waltz on themes of Gounod's "Faust," which alternated between the theme of Marguerite and a rustic dance of the villagers, and, I suppose the turmoil in Faust's mind as he looks on them and which to have his youth back. Bozhanov put the hammer in hammerklavier towards the end of this piece with a thunderous finale. It seemed over the top, but it was also fun to watch him bang on the Steinway. Some of the critics didn't like this at all, and I'm guessing the the jury might not have been all that impressed with it either. After intermission, Yeol Eum Son, the South Korean pianist, performed Chopin's Piano Concerto No. 2 in F minor, Op. 21. Son did a fine job but the dynamics in every movement ranged from medium loud to loud. She didn't get the attention of the audience because there was a fair amount of coughing during the second movment, which is a very sensitive and introverted part of the piece. Somehow, her Chopin seemed to be off the mark. Italian pianist Mariangela Vacatello, in the final number of the evening, gave a convincing performance of Beethoven's Piano Concerto No. 4 in G major, Op. 58. She dazzled the audience by feeling her way into the music and bring us with her. The soft and tender sections felt natural and genuine and not done for effect. Her fast and forte passages were scintillating and conveyed a sense of joy and completeness. Vacatello's stock in the competition just went up a couple of notches. But we are only half way through the competition at this point. More later. Tell us about how you work with the Van Cliburn finalists. Have the soloists changed in any way over the years? Conlon: All of the competition pianists are at that same point of life in their careers. They have emerged from their conservatories, and they want, very much, to be out in the public. So that factor has not changed over the years. I happen to love this stage in the life of an artist. This group of pianists here at the Van Cliburn surprises me every day. I meet every one of them for an hour. I wish that I could have five hours, but that’s the way it is. Sunday night the finalists are decided and Monday morning we start. I tell them that I won’t impose on them, but I also tell them what the orchestra and a conductor needs from them. Yes, you are a soloist. Yes, you may be a great pianist, but playing concerti is a collaborative effort and we – conductor and orchestra – expect things from you and need things from you. Some young instrumentalists don’t understand that when they get their big chance to play with orchestras. Especially young pianists, who can spend their entire lives in the practice room, may have this problem. Whereas violinists, violists, and cellists have to play chamber music or play in an orchestra from an early stage. So, one of the reasons I was motivated to come here – a competition is an imperfect way of sorting out the next major artists – I’m sure that you’ve all dealt with the issue that in a Darwinian way there are certain people who often win the competitions and they are the least interesting artists. That might be because of two factors: juries tend to move more to the middle. If you are too far out of the box won’t get enough votes. The other factor is that species tends to emerge from the competition which boils down to who has the best nerves. Yet the ones with the best nerves are not necessarily the most interesting artists. And there are the extreme cases like Glenn Gould who could barely get himself onto the stage and Carlos Kleiber hated to go on the stage. So, in the past I’ve conducted orchestras that have engaged a winner of a competition and that young person doesn’t listen to the orchestra. He or she assumes that you understand. Well, I and the orchestra are professionals and we get through the concert and we never want to see that soloist again. So sometimes there’s an arc or curve to the careers of these people. For two or three years their trajectory is up and then it goes down and it never comes back again. So, I made it clear that if I were to come here to conduct, I would like to make a stab at making it clear to the pianists that they have responsibilities to us. For example, I tell them not to crash in before the orchestra because it takes time for the sound of an orchestra to get there. It’s a fact of acoustics. Now regarding the Japanese pianist who is blind, Nobuyuki Tsujii, we should restrain ourselves on this issue, because it distracts us from the essential issue that this young man should be judged on his performance on objective standards like any other musicians. It is on a human level astounding and very moving. I have never seen anything like this. So, it’s about the music even though the story of this man is very moving on a human level. Now yesterday I had to work with him and it was a very enriching experience for me. He has an astounding talent. In Rachmaninov’s second piano concerto there’s a huge C major chord that we have to coordinate. I thought that we count the beats in the silence, but that’s not going to work; so his English interpreter came up to me and said that he is very sensitive to people’s breathing; so I inhale audible, and so far it’s worked every time in rehearsal. It’s amazing, and hopefully it will work in the concert. Are you optimistic about artistic talent? Conlon: Yes, we’ve got more people listening to classical music than ever before. But now we are producing so many talented musicians that we don’t have enough places for them, especially for pianists. There are more orchestras now than ever before. And the US now has 10 or 15 of the best orchestras in the world. But China will probably surpass us in a generation or two. Have you noticed any trends among the judges at the Van Cliburn? Conlon: I am not privy to the whole process of the jury here. I come in right at the end, and they ask me of my assessment from my perspective. Then they do what they want with that. I am not in on their discussions. Also, I didn’t hear any of the recitals before the finals began because last Saturday I was in Cincinnati conducting the Mahler 8th as in celebration of my 30th year as the director of the May Festival. What can conductors do to help the marketing of classical music. Conlon: Basically nothing. Conductors don't talk much with other conductors. You know there are no conductor's union. Piere Monteaux once said that a conductors is an old man standing at the top of a ladder who is kicking off everybody who is trying to come up. I attended the second concert of the final round last night at Bass Hall and immediately noticed that more people were in attendance than on Wednesday evening and that the wardrobe-glitz factor had also increased. This is my first time at the competition, and it's the first time that I've seen a camera suspended from a long arm (or boom) from the ceiling above the stage area. This camera swings silently above the performers and captures their performances for the Cliburn TV production. It's remotely controlled from a booth somewhere. This camera-eye thing is not obtrusive and the audience seems to adapt to it very quickly. I've only seen cameras onstage once before - at the Defiant Requiem concert (Oregon Symphony/PBS) a severak years ago and they seemed to disturb the whole concert experience, because, there was a person who had to ride with the camera as it hovered above the stage and swung around to capture the chorus, orchestra, and soloists. So, if orchestras folks should come to the Van Cliburn festival to a good look at the camera here to see how it might enhance the concert experience. Last night (Thursday, June 4), the concert began with Yeol Eum Son, a 23-year-old pianist from South Korea, who played really, really well. Her made the Petri arrangement of Bach's "Sheep My Safely Graze" sing with elegance. Son followed that with two impromptus by Schubert: the Impromptu in B-flat major, D. 935, No. 3 and the Impromptu in F minor, D. 935, No. 4. Besides playing both pieces perfectly, Son gave me the feeling that she was creating a special sound world for everone and taking us there with her. Then she did that again with wonderful playing in Beethoven's Sonata in C minor, Op. 111. I liked the dark, low muttering tones that she explored in this work and contrasted it well with the higher stuff at the treble end. I could not tell if she was sucking in air with some kind of restrictive breathing during the fast and loud portions of this piece, but I'm pretty sure that it came from her and it was the only thing that marred her performance. The concert hall seemed a little fuller after intermission, and I suspect that some people came to hear and see the blind pianist from Japan, Nobuyuki Tsujii. Well, they saw the real deal. 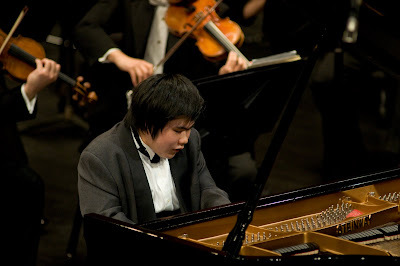 Tsujii delivered a stunningly beautiful performance of Chopin's Piano Concerto No. 1 in E minor, Op. 11. Using a full range of expression from very quiet piannissimos to good, strong fortes, Tsujii transported the audience to a higher level. It was an amazing thing to experience. The audience sprang to its feet after the last note died away, and Tsujii was called back for several bows. He had a big smile on his face. Given the unenviable task of following Tsujii for the last performance of the evening, Chinese pianist Haochen Zhang, who just turned 19 years old the day before, took the stage to play Mozart's Piano Concerto No. 20 in D minor, k. 466. Zhang has brilliant technique and played a wickedly difficult cadenza with gusto. But he had too much gusto for this work, which need a lot more nuance in phrasing and in volume level. The entire piece was played from medium loud to loud and much of the time I had the feeling that Zhang was rushing. The audience responded to his performance with good, long applause and some folks gave him a standing ovation as well. I will be posting articles about the Van Cliburn Competition, because I'm am attending it as an invited member of the press. Last night I heard the first concert in a series of six. Mariangela Vacatello, a 27-year-old pianist from Naples, Italy started things off with a piano recital of Bach's Italian concerto in F major, BWV 971, Chopin's Rondo in E-flat major, Op. 16, Ravel's "Gaspard de la nuit", and Shostakovich's Prelude and Fugue in D-flat major, Op. .87, ,No. 15. In Vacatello's hands, the Bach was precise, understated, and genuine, Chopin crisp, and the Ravel very evocative. She ended her recital with a rollicking Shostakovich. The audience rewarded her with sustained applause and I think that they took three bows. Bulgarian pianist Evgeni Bozhanov (age 24) played Chopin's Piano concerto No. 1 in e minor, Op. 11 with the Fort Worth Symphony under the baton of James Conlon. Bozhanov gave a spiritied performance of this work. I wasn't entirely convinced of his pianissimos and I think that he could've lingered here and there a bit more, but everything else was pretty outstanding, and the audience applauded vigorously right after he finished. 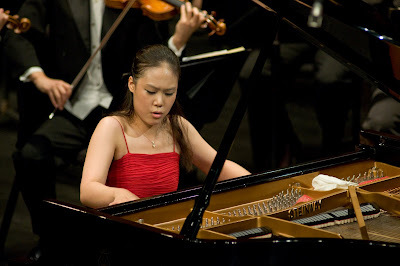 Di Wu, a 24-year-old pianist from China performed Beethoven's Piano Concerto No. 2 in B-flat major, Op. 19 with the orchestra under Conlon. I liked her enthusiasm for the piece, but her playing seemed a little out of control. The audience responded to her with warm enthusiasm. Tonight, I'll hear three more pianists, including the 20-year-old blind pianist from Japan, Nobuyuki Tsujii. If you are curious about these pianists and the their competitors in the Van Cliburn Competition, click here. From the moment that members of the Pink Martini ensemble stepped out onto the stage on Monday evening (June 1), the standing-room only audience of the Arlene Schnitzer Concert gave them and the members of the Oregon Symphony a city-wide group hug. This was the second in three nights of sold-out performances, and the festive atmosphere bathed the concert in a glow that made the added mood lighting unnecessary. I came to this concert with some skepticism, because I had heard a Pink Martini concert with another orchestra (on or near Valentine’s Day) a few years ago and came away unimpressed. This time, however, Thomas Lauderdale and his sophisticated lounge ensemble were on top of their game. 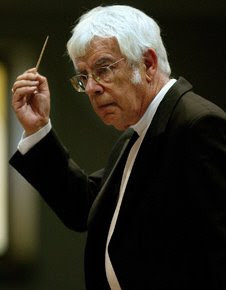 Another problematic element are orchestral arrangements, because they can make the whole thing sluggish, but to my delight, from the get-go at the top of the program with the first notes of “Quizás, Quizás, Quizás” (“Perhaps, Perhaps, Perhaps”) by Cuban composer Osvaldo Farrés, Pink Martini and the Oregon Symphony knocked the music out of the ballpark. And they continued to do so with each number on the program, highlighting the singing of China Forbes, the playing of instrumentalists in the 12-member ensemble, and the playing of the orchestra, including some featured spots for several principal orchestra members. Thomas Lauderdale, showed his leadership with impeccable playing on the piano and in mc’ing the concert, teasing the audience with off-the-cuff remarks and with his slightly impish mannerisms. Forbes sang with full-flavored passion that worked like magic, and she received thunderous applause after each number she performed. The Lauderdale/Alex Marashian arrangement of “Splendor in the Grass” took on a surprisingly new dimension with a snippet of Tchaikovsky’s Piano Concerto rolled into it. The raspy duet between trombonist Robert Taylor and trumpeter Gavin Bondy in “The Flying Squirrel” (written by Lauderdale and Stephen Taylor) put everyone in a speakeasy from the 1920s. Violinist Nicholas Crosa performed Fritz Kreisler “Praeludium & Allegro” superbly. Cellist Pansy Chang shined in her playing of Ravel’s “Piece en forme d'habanera” (arranged by Norman Leyden). The selection of tunes from Latin America played nicely into the hands of Oregon Symphony’s conductor Carlos Kalmar, because he is a native of Uruguay. I enjoyed Kalmar’s conducting, because he didn’t use the baton (except for two pieces) which helped to soften the style of the orchestra. The orchestra’s strings were as smooth as glass whenever needed, yet the ensemble provided plenty of dramatic crescendos and cut offs. When the orchestra got louder it seemed to drown out Lauderdale at the piano, but microphones and technology will probably make up for that in the final recording. Individual highlights in the orchestra, included solos by principal trumpet Jeffrey Work, principal flutist David Buck, principal oboist Martin Hebert, and concertmaster Jun Iwasaki. Forbes and Kalmar traded places during Franz Lehar’s “Il fox trot delle gigolettes.” That is, Forbes conducted and Kalmar sang it in German. That was really fun to see and hear, and Kalmar endeared himself to the audience with his rendition. According to the Lauderdale, recordings taken from this series of concerts will be released in March. It should be a big hit. In the meantime, Pink Martini will release its next album in October.